If you are using electric radiators as your central heating system then you will need a method of heating your domestic water for sinks, showers and baths. Unique, integrated and factory fitted expansion solution and control valve. Superior heat up & recovery times and suitable for off-peak tariffs. Laser welded Duplex steel, ECO Foam insulation and 25 year guarantee. Very low heat loss meaning very low energy usage. The Electrorad cylinder has a unique, integrated expansion solution factory fitted. All pipes & connections are also hidden under an insulated top lid. Factory fitted components drastically reduces fitting time, making the Super Series virtually a pre-plumbed unit. Duplex Stainless Steel makes the cylinder extremely lightweight & space efficient for easy handling & installation. Low heat loss, dedicated secondary return, impressive heat up & recovery times and a 25 year guarantee. 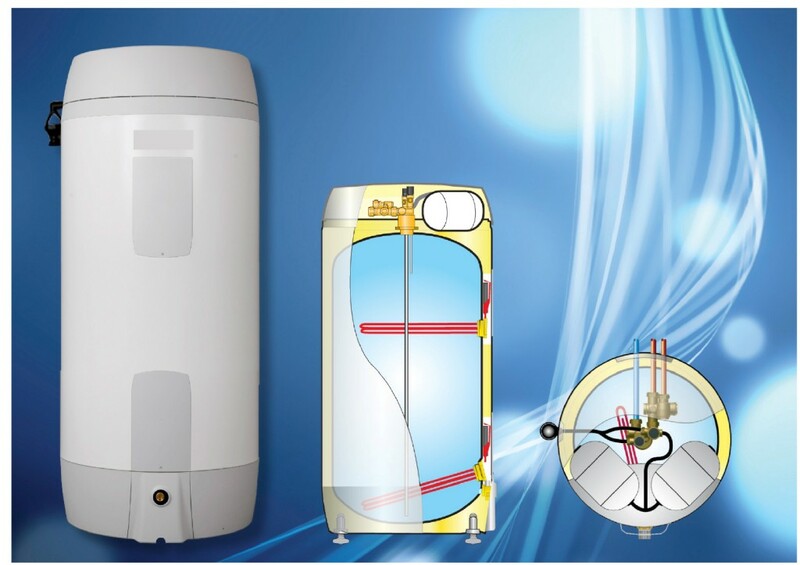 The Electrorad cylinder is a quantum leap in unvented cylinder design. All pipes, expansion vessels and electric cables are hidden from view beneath an insulated removable lid giving the neatest possible installation. A bespoke multifunction valve, including a unique blending valve is factory fitted with the supplied expansion vessels to make the Electrorad cylinder virtually a pre-plumbed unit. Adjustable feet are also integrated. Cylinders from 150 litres are fitted with twin immersion heaters, suitable for off-peak tariffs. All pipes connect from the rear, allowing them to be concealed from view. The installer fits the pipes to the back wall together according to a supplied template and finally slides the cylinder into place to marry the valve connections with the pre-cut pipe tails. If you just require hot water for sinks, then it is possible to use a mini cylinder ( see below ). The mini cylinder will supply enough hot water for two sinks. This is suitable for example if there is no bath in the property and the shower is electric. The Mini is a 5 litre point of use water heater, with an impressive 6 minute recovery time. The small size makes the Mini ideal for under sink fitting in office buildings etc. where the central hot water supply is located at a distance. The Mini can be installed both vertically and horizontally, and has a factory fitted thermostat adjustable 30°C – 60. The MINI is perfect for point of use “under sink” water heater. The 3kW element will heat the 5 litre capacity from cold in less than 6 minutes. The unit will be most efficient when fitted horizontally. Wall mounting brackets are provided with the cylinder. 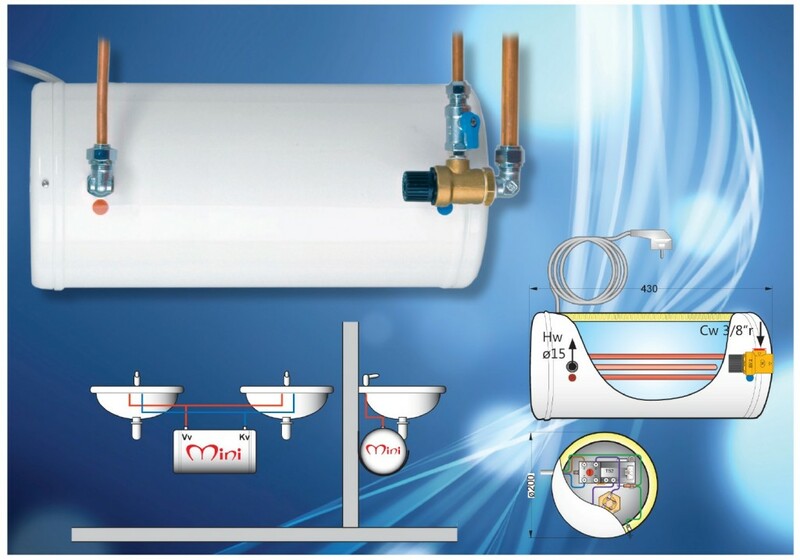 Although The MINI is an unvented cylinder, it requires no expansion vessel, although an expansion relief valve for connection to a waste pipe is supplied. Domestic water expansion is accommodated safely and legally within the cylinder and associated pipework. No check valve should be fitted within 2m of the MINI, to avoid the need for an expansion vessel. Temperature control is achieved through a factory fitted adjustable thermostat, with an additional overheat safety cut out. An electrical cable is supplied factory fitted to the cylinder for connection to the mains supply.